Dinner had been done for over an hour. I love that we were still tonight, seated around the kitchen table ..
As a child .. almost every night was spent at the dining room table, together. Family meals were our norm. Most often, my dad would be at the stove already hard at work on some never measured out concoction that would taste fantastic when all was said and done, before our mother would ever get home. We would all then sit down to eat. And talk. In our various family forms since my daughter came along, we have done the same. But the time I currently have at the ranch has allowed me a lot more time to cook, think about meal planning and to stay seated at the table well past dinner being done to hang out, talk, enjoy each others company. Tonight, it was a dish dad used to make all the time. My first attempt. 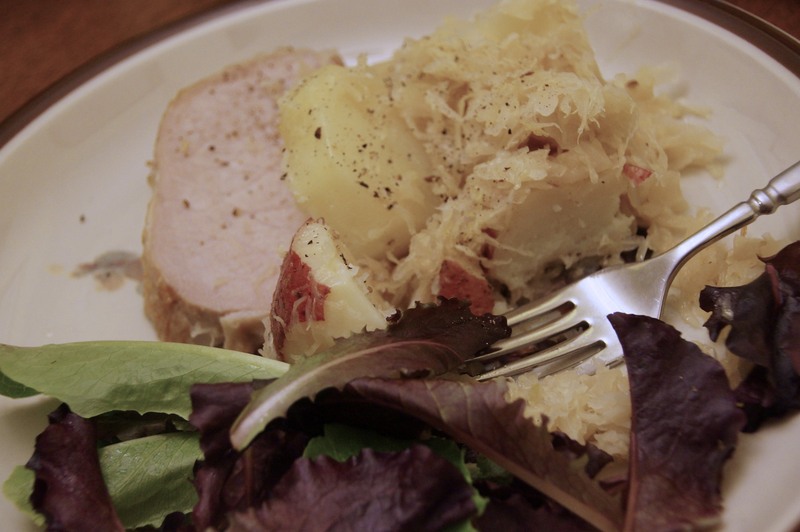 Pork chops, potatoes and sauerkraut. Dad would usually throw it all in the pressure cooker. (“Don’t touch it, it can explode,” dad would say of the pressure cooker. I have been afraid of them since.) I threw tonight’s meal in the oven. An hour and a half later .. it was done. The Cowboy had just come back in from working with one of the horses. Our 11 year old was shortly behind him after spending time on her favorite horse as well, despite the frigid temperatures. “That was really good,” said the Cowboy. My daughter simply cleaned her plate (minus most of her sauerkraut) and then asked for more. This entry was posted in At the Ranch, Cooking, Cowboy, Family, Food, Life, South Dakota, Uncategorized and tagged Back when I was a kid, Dads cooking, Family meals, Food, Home cooking, Meal planning, Pork Chops, Sauerkraut by Carleen Wild. Bookmark the permalink.